There are several reasons one may want to start a garden indoors. The aesthetic value of plants is an obvious one. For serious gardeners in colder climates, indoor gardening allows them such opportunities as growing vegetables, maintaining exotic plants, like elephant ears and experiencing the pleasure they derive from gardening year-round. Indoor gardeners follow two styles: container gardening and hydroponic gardening. Container gardening is exactly like outdoor gardening with traditional soil and planters. This is typically done for plants that will be moved around, arranged in specific ways about the house, or eventually transferred to an outdoor garden. Hydroponic gardening requires a vertical plant arrangement and fertilized water instead of soil. This is typically done for growing vegetables or growing a large garden. Hydroponic plants use less energy gathering nutrients and spend more energy growing. Below is a list of essential and optional tools needed to create a successful indoor garden. The amount of food, water, and light provided to these plants vary depending on how much a specific plant needs. Potting soil. Potting soil is where the roots gather their nutrients. Many varieties are sold, and they mostly contain different mixes of organic matter, perlite, and sphagnum peat moss. The organic matter provides nutrients. Peat moss holds in the water and perlite separates the moss just enough to allow slow drainage. Some soils contain fertilizer, but eventually the soil will use this up and additional organic matter is needed every few months. There are several recipes online for homemade potting soil if the gardener wants to control for quality and composition. Compost or fertilizer. Compost or fertilizer provides the organic matter plants need readily available to grow strong and fast. Plants require six nutrients: carbon, hydrogen, oxygen, nitrogen, phosphorus, and potassium. The first three are gained from air and water. The other three come from the soil and fertilizer. Organic fertilizer is preferred over synthetic as organic is not water-soluble and is released into the soil over several months. Composting is a great alternative to fertilizer and can reuse garden or kitchen waste, grass clippings, and weeds. Plants/seeds. It is necessary to research the appropriate types of plants for a garden, as they are all different in their needs for light, soil composition, temperature, and hydration. Pots. Almost anything goes as long as it is clean and has a hole in the bottom for drainage. Plastic, terra cotta, and wood are all acceptable (metal can be corrosive to nutrients). Plastic is best for retaining moisture. The best types of wood are redwood or cedar, which are more resistant to rot than others. Seeds can start in small containers and root balls need a container twice their size. Rocks can be added to line the bottom of the pot for more drainage. Watering can. A cup or jug of water works fine as well. Soil thermometer. For most plants, it is best to maintain temperatures between 75-85°F, as microorganisms will be much more active at this level. Neem oil. Pests and disease spread quickly from one plant to another. Neem oil is a plant-based substance containing natural chemicals that control mites, insects, fungi, and other plant diseases. Hand tools. Tool sets typically contain large and small pruning shears, a rake, a trowel, and a spade. Grow lights. When gardening indoors, access to sunlight can be difficult. Fluorescent light bulbs are noted to be affordable and effective, though specialty garden heat lamps (which emit broad spectrum light waves) are available. There are also timers available to turn the lights on and off at specific intervals. We recommend using LED grow lights. Drip system. For those who have trouble remembering when to water plants, there are automated drip systems consisting of small tubes that supply each plant at regular intervals. There are also sensors available that can display how “thirsty” a plant is. Oscillating fan. This keeps air circulating in order to remove oxygen and bring in fresh CO2 for the plants to absorb. Fans also keep the air dry and prevent mold, as well as prevent lights from overheating the garden. Heat mats. These are placed beneath the soil and heat from the bottom-up. Soil test kit. For most plants, it is ideal to maintain soil pH between 6.0 and 7.0. Soil samples can be sent to a lab or tested by home test kits. Lab reports include recommendations on how to alter the pH to optimal levels. In general, ground limestone is used to reduce acidity and powdered elemental sulfur or compost increases acidity. Cotton swabs. These are to be used if there is a need for pollinating the plants, as there are no bees or wind to do the job indoors. The process varies depending on the plant, but generally, the swab is twirled inside the male blossom to pick up the pollen and then brushed onto the stigma of the female blossom. Some are the same as above. The items from the above list that are also essential to hydroponics are: plants, pots, a thermometer, neem oil, and hand tools. Water tank, pipe system, and pump. Fertilized water is stored in tanks below the plants and are pumped through the adjoining pots and drained back into the tank. Sometimes the water tank acts as the pot, where the roots hang directly into the tank. The tank needs to be lightproof to prevent algae and microorganism growth. A hydroponic system can be purchased in its entirety or built at home. The pump and its filter should be cleaned regularly. Pipes can be made from PVC tubing, garden irrigation tubing, or dark-colored vinyl tubing. Fertilized water. Special liquid fertilizer is added to water in order to provide all the nutrients that are typically needed in soil. Water can also be fertilized through the use of fresh water fish (see below). Instead of soil, pots should be filled with perlite, a porous soil replacement. Clay pebbles or rockwool are good alternatives. pH test kit. The pH levels in the water should be checked regularly. The fertilizer nutrient solution can be used to stabilize pH, but there are also bottles of acid and base available that can bring the pH up or down. Fresh water fish. Placing freshwater fish in the tank is a great way to fertilize the water, as their natural waste products provide the plants with the proper nutrients. Shelving system. Hydroponic shelves exist with a space for the tank at the bottom and shelves above for the plants, lights, and drip system. Drip emitters or sprayers. These can be added to the hydroponic watering system to increase nutrient exposure to plants. Air pump. An air pump is probably best used for plant roots constantly submerged in the nutrient solution (in the tank). Air pumped into the water keeps it oxygenated so the plant roots do not suffocate. COMPLETE indoor Growing Tips and Help! For beginners, typical home improvement stores have all the tools needed for a great indoor garden. With the items above, gardeners can enjoy their hobby inside the home, all year long. I have never used a soil test kit. 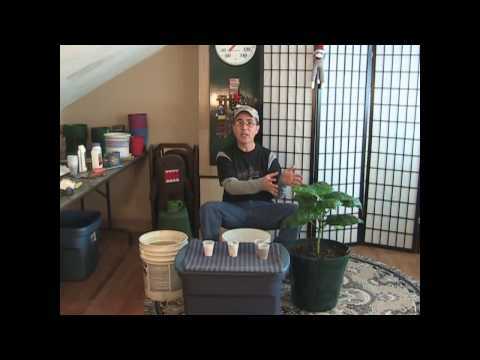 I have heard that keeping your soil at the proper acidity can have an affect on your plants. I had assumed that the potting soil that I bought would be in the range that the article mentions. Now, I realize that those levels can change. So, I need to learn how to control those levels. Plantozoid.com is a participant of the Amazon Services LLC Associates Program, an affiliate advertising program – it is designed to provide an aid for the websites in earning an advertisement fee – by means of advertising and linking to Amazon.com products. © Copyright Plantozoid 2017. All Rights Reserved.